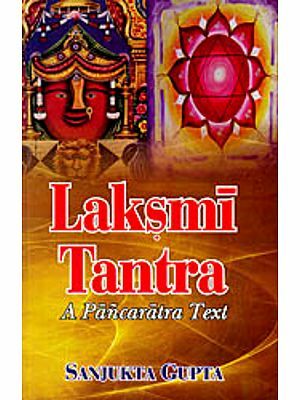 The worship of Saptamatrka; the seven Mother Goddesses (or the seven Saktis, the divine feminine powers), is over a millennia and halfold, pan-Indian phenomenon. 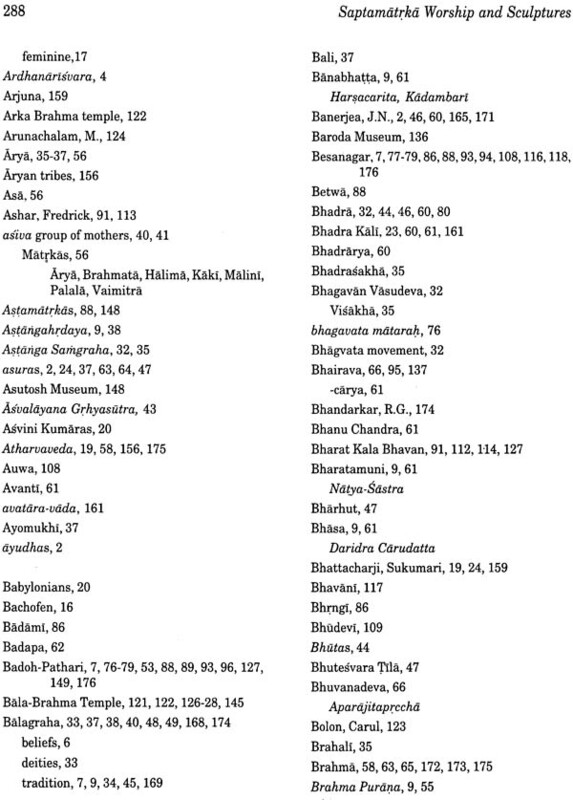 And, over the centuries, the Matrka concept has come to have varied ideational, literary, visual and ritualistic manifestations - which not just interconnect the tatality of Brahmanical and non-Brahmanical religious traditions, but are integral components of the diverse historical processes of Indian society. 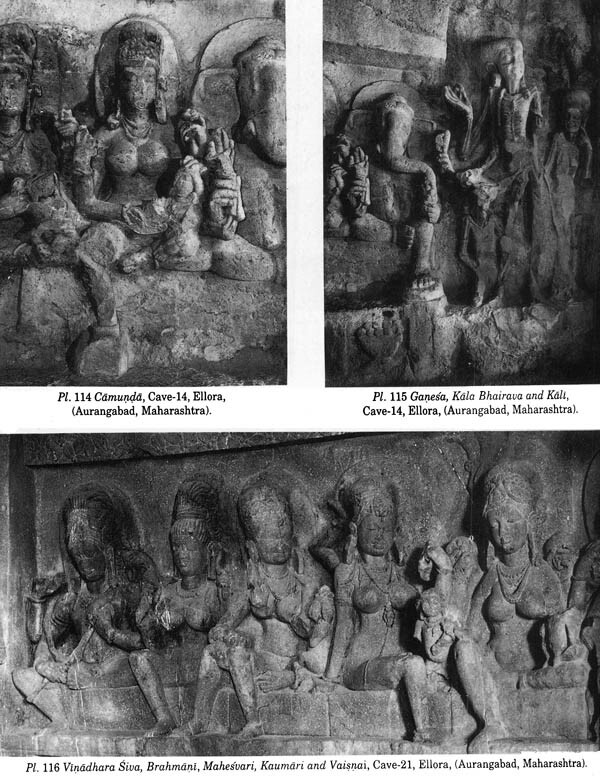 A reputed scholar of art history here offers an insightful iconological study of Saptamatrka divinities : the Brahmanical goddesses found invariably as a single collective whole, consisting literally of seven (though sometimes eight or more) female deities, variably accompanied by different forms of Siva, and Ganesa or Skanda. 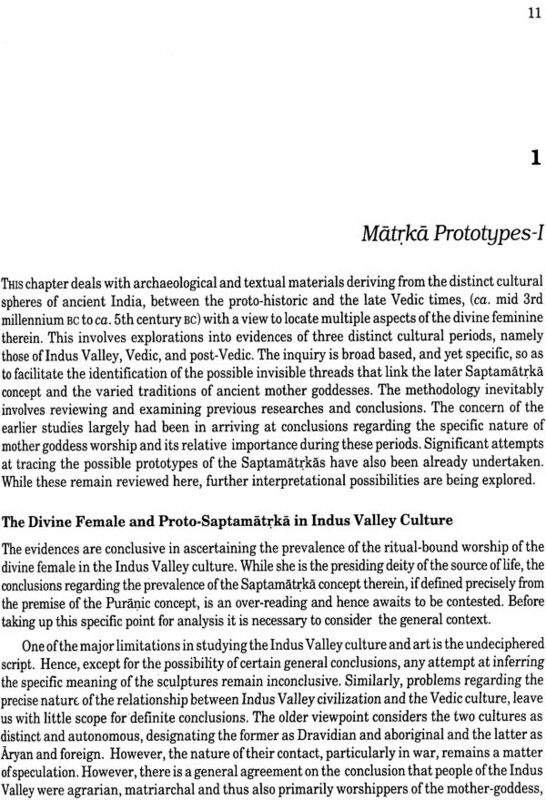 Employing the multidisciplinary methodio-logies of art historical interpretation, including the recent feminist interventions, Dr. Panikkar's inquiry contexualises nearly the whole range of Saptamatrka icons within the larger historical evolution of accultured Brahmanical religion, mythology, theology and concomitant multifarious cultic developments. 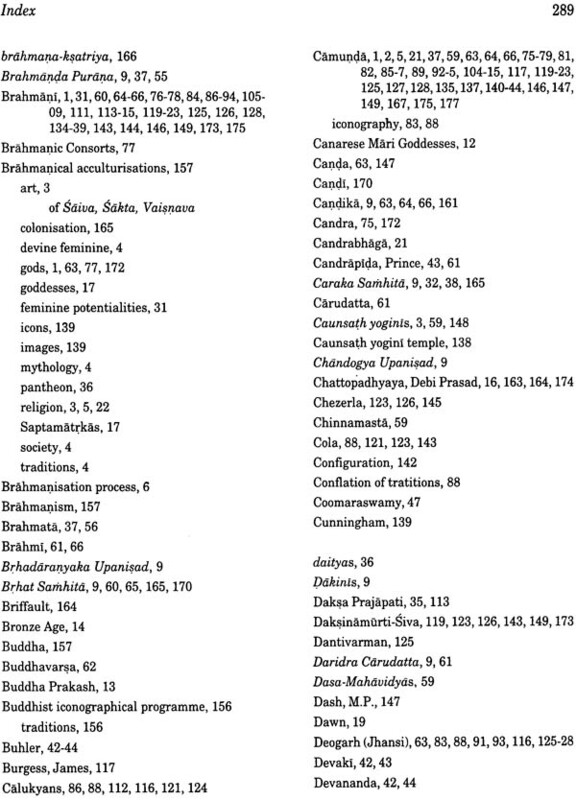 Also clarifying some of the basic principles of Brahmanical iconic tradition, his study has, for the firs time, exceeded the accepted Art Historical procedures by incorporating the questions of class conflict, gender 'representations' and ideology within the iconological discourse - and has, thus, advanced the frontiers of Art Historical practice. It is a compelling, painstakingly researched work growing from the author's indepth survey of diverse Saptamatrka sculptures, and an astonishing mass of both primary textual sources and research publications of more recent years. And, yet more significantly it is enlivened with exquisite visual material: comprising nearly 200 photographic reproductions. Currently Reader in Art History at Baroda's M.S. University, Dr. Panikkar is indisputably an untiring researcher, with varied concerns: ranging from contemporary art practices to the issues of interrelationship of art, politics and ideology in both traditional and modern arts. Already his published work comprises a considerable body of writings that include exhibition catalogues and thematic articles - besides three volumes of edited works on different genres of art, in his capacity as an assistant editor and co-editor. 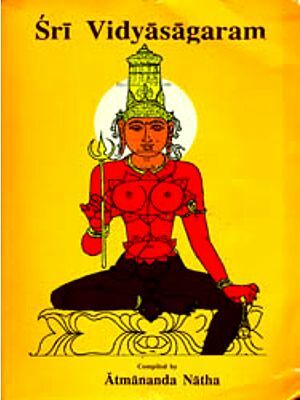 THE Devi Mahatmya, the early Sakta text, describes the Matrkas, Brahmani, Mahesvari, Kaumari, Vaisnavi, Aindri, Varahi, Narasimhi, and Camunda as saktis (embodiments of the potent feminine powers) of the respective Brahmanical gods, who are generically named as matr or matri, and in a group as matrgana, meaning mothers. Etymologically matr derives from the root ma, meaning to measure, or to be contained or comprised in.' Matr, thus means a mother, who contains, obviously referring to the maternal potential. Monier Monier-Williams, based on the Rgveda interprets matr as, to measure or to traverse, to be large or long enough to find room or to be contained in." 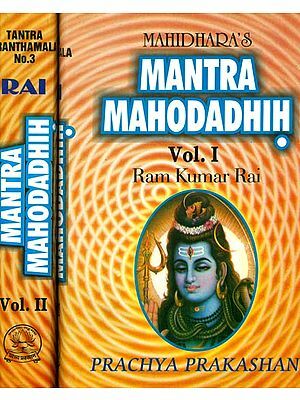 Rgveda interprets matri as one who measures across or traverses, and as one who has true knowledge," obviously meaning that of regeneration. Matr also means a mother as a term of respect or endearment.' When used generically, matrka means all kind of groups. Matrka as used in the present work refers to the sakti embodiments of respective gods as described in the Brahmanical literature, who in iconic sculptural portrayals are the divine mothers and warriors, used for ritual worship. The Matrka-worship and the related manifestations in plastic arts are a pan-Indian phenomenon, the antiquity of which is considered to be as ancient as that of Siva and the fertility goddesses of the Indus Valley civilization. The distinct, ideational, literary, visual and ritualistic manifestations of the Matrka concept, are interconnected with the totality of Brahmanical and non- Brahmanical religious traditions. And these are integral components of the multifarious historical processes of Indian society. 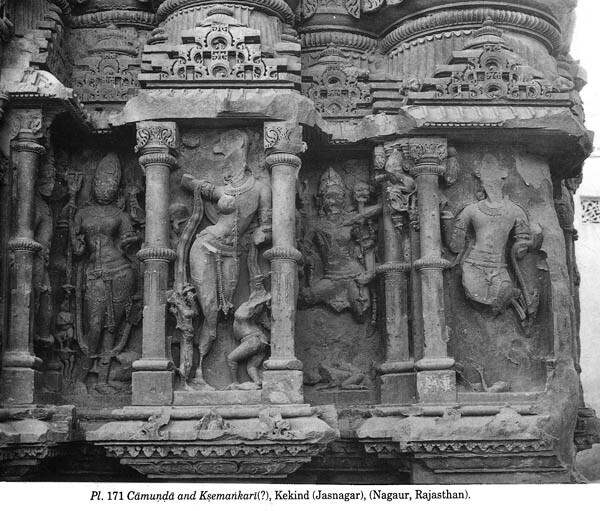 The initial inspiration for this came to pass incidentally in May-June, 1982, while assisting Prof. Ratan Parimoo in documenting Vaisnava sculptures in Madhyadesa. 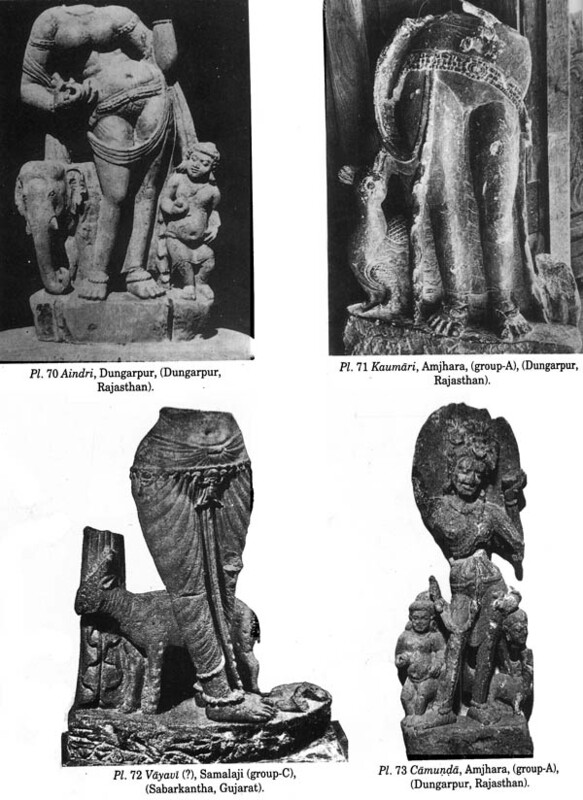 A number of Matrka sculptural portrayals in this region, including some of the earliest ones, prompted me to imagine their cultic significance in the Brahmanical pantheon. 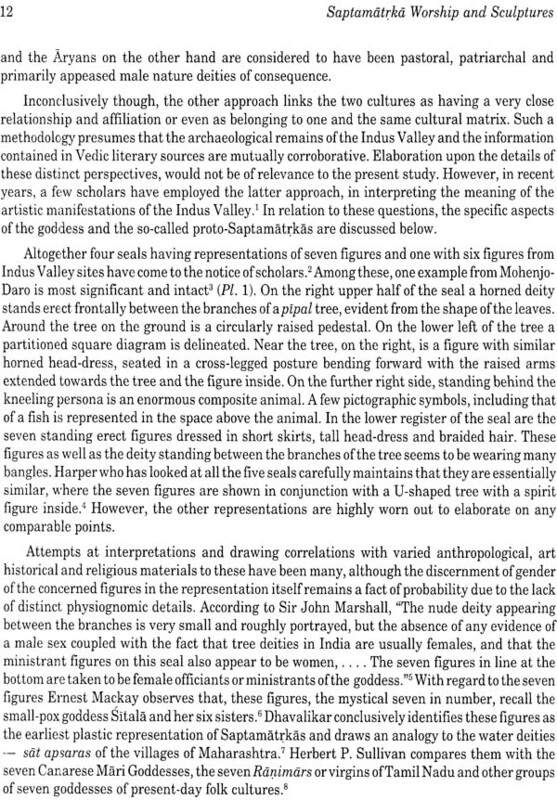 The early Matrka sculptures at Badoh- Pathari, Udayagiri, Besnagar and Deogarh, their iconographical and stylistic features, further made me inquire about the possibilities of studying the evolutionaryprocess therein. Subsequent research opened up the possibility of probing into the problem of origin, development and diffusion of the Matrka concept and images at distant regional centres. At this stage assisting Prof. Parimoo on the U.G.C. research project on Vaisnava art had greatly helped me in formulating a methodology suited for such an iconographical study. 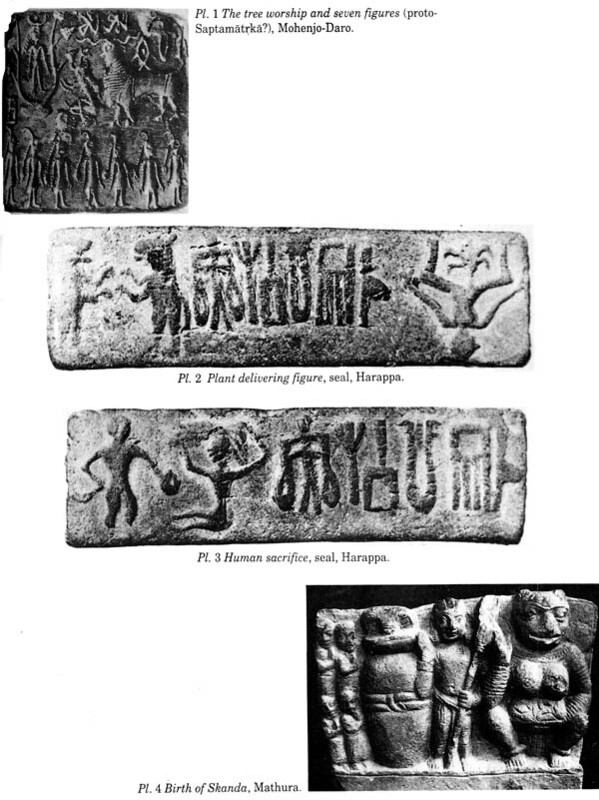 Specifically, the research carried out on the development, diffusion, regional variations, textual sources and sculptural manifestations and meanings of a single iconographic form, that is of the Sesasayi Visnu, provided valuable experience in this direction (Sculptures of Sesasayi Visnu, M.s. University of Baroda, Baroda, 1983). Further, a valid ground was yet to be arrived at, in order to locate the iconography, which lead me into the dialectics of political, social and religious histories. And a theoretical premise evolved incorporating the gender issues as well, giving the work, I think, extensive and intensive implications. The pioneering effort of T.A. 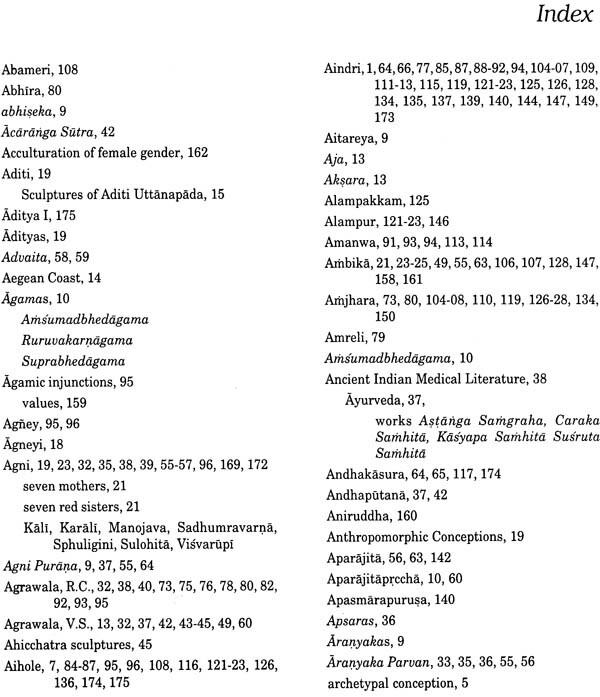 Gopinatha Rao discusses only the most obvious iconographical features of Matrkas, where these are correlated to the myths and silpa sastra stipulations. J.N. 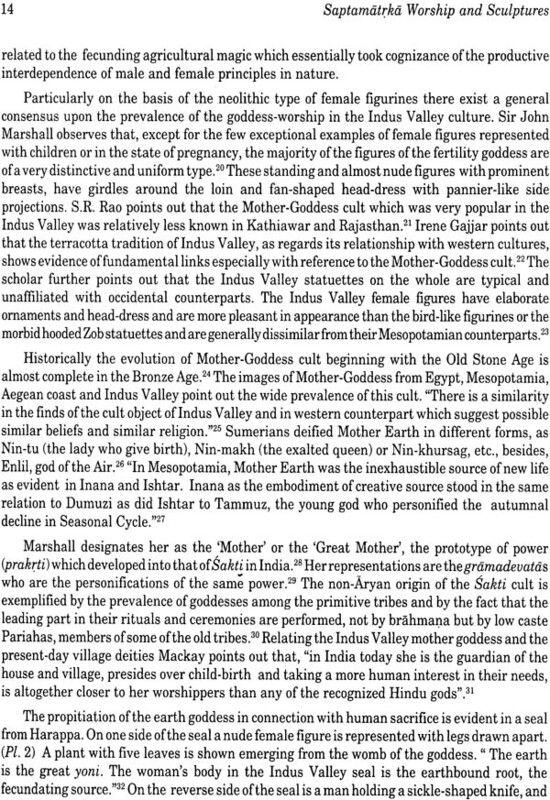 Banerjea's work which followed, traces in certain detail the linear chronological sequence of the cult of goddesses from the Indus Valley civilization till the medieval times. 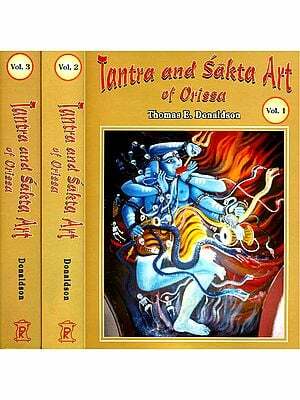 Within this background, the general descriptive analysis of the two important iconographic forms, namely, that of Durga and Saptamatrkas have been undertaken. The later art-historical researchers can be seen either resorting to the models set by these two scholars or merely adding up further sculptural and literary data in the general fund of information regarding the goddesses tradition. The main emphasis was trying to match the sculptural and literary data. 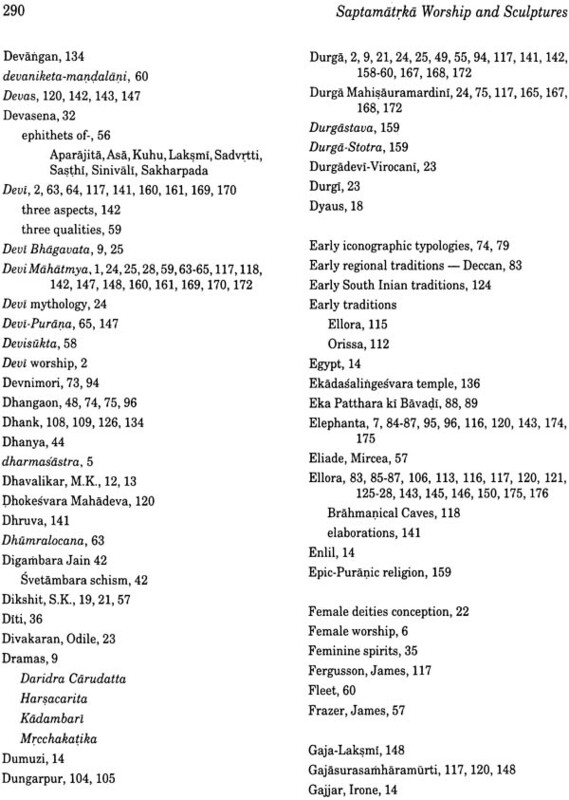 A large body of research publications of the more recent years analyzing the origin and development of Devi worship in India using evolutionary models have been extensively used in the present study. 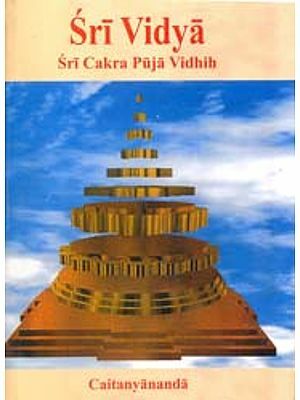 A major methodological facet of this study derives from the structural analysis of Devi myths by scholars. These are incorporated in the relevant places of this book. The major aspects of the Matrka concept can now be delineated. Inherently, the Matrka divinities are dichotomous personalities- Though represented as goddesses, their identity and attributes largely derive from the respective male deities. Theologically, this is explained in terms of them being saktis, or the feminine power of the male gods, and hence imply a co- existence of the principles of male and female in the one and the same. Further, Matrkas of the Puranic myths are militant, ferocious, blood drinking goddesses of the battlefield, assisting either Siva or Devi in their battle against asuras. Yet, in the sculptural portrayals, generally, (at times, with the exception of Camunda), they are depicted as benevolent, compassionate and aristocratic mothers. Their motherliness is often accentuated by the playful attitude towards the children, with whom they are portrayed in certain regional traditions. But, the ayudhas, the war props they hold, imply quite a different meaning level, and indicate conflations of and resolutions of conflicts based on the socio-political and economic realities of ancient India. This, validates the extended title of the book, 'Conflicts and Resolutions in the Storied Brahmanical Icons'. Matrkas embody syncretism between various principal sectarian Brahmanical cults and other theophanies. Yet, the tradition proves the primacy of Saiva cult over others, considering . the specificity of iconographic programme, and also since Matrkas form a significant component in the iconographical layout of Saiva caves and structural temples. The book is iconological, since the interpretations of the icons are contextualised within the larger framework of historical evolution. Thus, the socio-politico-economic and religious contexts of art receive an equal importance as the art itself, and is treated as an integral part of the sculptural manifestations. The particular iconographical tradition which begins during the Gupta period, presents highly complex meaning levels as it goes through varied sculptural interpretations in the subsequent centuries at different regional centres. 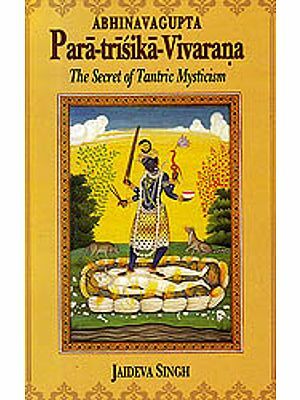 In the medieval times the importance of Matrka divinities recedes considerably, but lingers on faintly in the Hindu pantheon till today. During the medieval times cultically and iconographically a more elaborate tradition of Causat Yoginis are invented, possibly based on the Matrka tradition, which by itself is a separate area of study. The book is also an attempt at transcending the limitation of fragmentary understanding of the Saptamatrka iconography, since it takes into consideration temporal and spatial developments in the pan-Indian context. 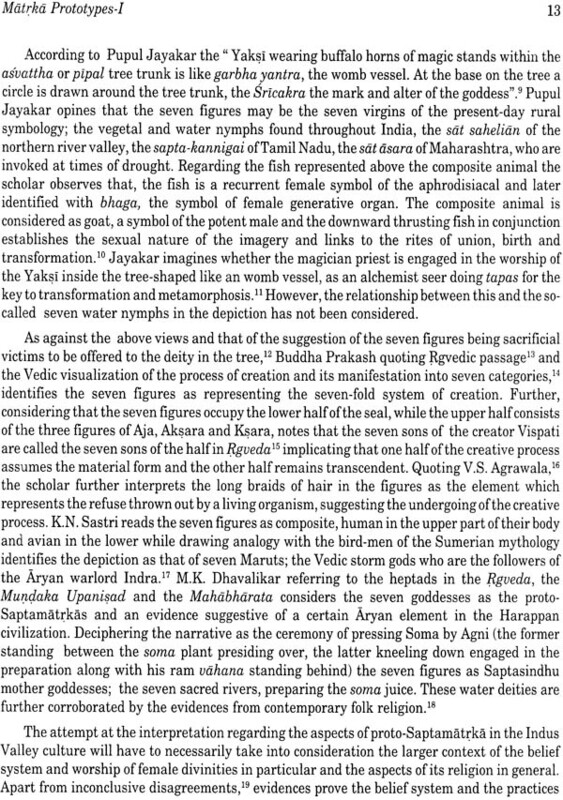 Further, the book also throws light on the significance of Matrka images in the wider context of Brahmanical art (of Saiva, Vaisnava and Sakta denominations) which had been overlooked at least by some scholars. Before going into the theoretical framework and the methodology employed, a few explanations of the terminologies may be useful. The terms Aryan, non-Aryan or Dravidian are not used with any implication of races, but imply only the class differences, or at times with an intent to distinguish the orthodox and heterodox social spheres. 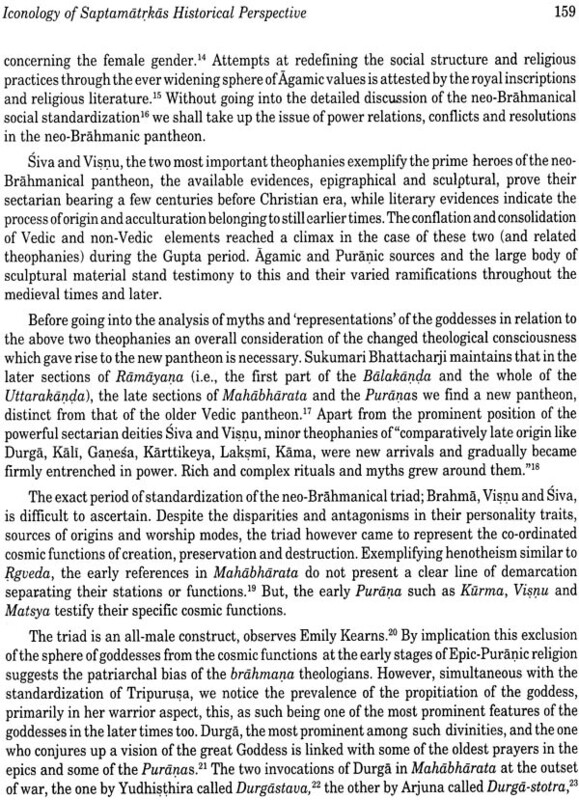 Brahmanical denotes the religion essentially practised and propagated by the brahmana varna, including the other varna groups who came under this hegemony. This accultured realm is denoted by the use of the term neo- Brahmanism, which is differentiated from the orthodox Vedism/Brahmanism. The use of the term Hinduism is purposefully avoided in these, since it is an invention of the European colonizers, and may be more appropriate for the modern Hinduism. Apart from the prime concern with the sculptural materials, the Brahmanical religion in totality, particularly neo- Brahmanism, with the sectarian import of the latter and the historical issues of class and gender, are the primary foci of this study. The heterogeneity, inconsistency and contradictory conflations noticed in the primary materials are very many. This is so, since the catholicity of neo-Brahmanism "denies nothing and is intolerant of no level or phase of religious consciousness". Considered theoretically, acculturation is viewed as a historical strategy ofthe evolving dominant power nexus between brahmana and ksatriya. castes, effecting subordination of the 'lower' classes and female gender, through assimilation. The co-existence of disparate elements and stages of religion from the primitive to the sophisticated; the mythological, theological and philosophical rationalisations, and the absorptions and re- interpretations of these were contained within an overall system, which allowed adequate space for conflict and resolutions of sustenance among the dominant power groups. Symptomatically, it can be read within a colonizer-colonized mode of discourse. 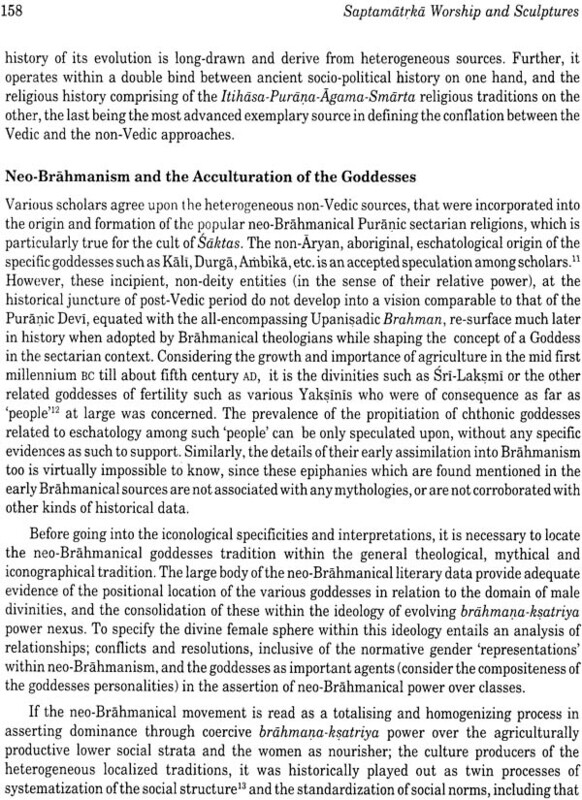 The divine feminine in the Brahmanical tradition, throughout its history, has remained a male construct, deriving its validation, legitimation and 'representation' within the patriarchal kinship relations of the higher varna groups, and having socio-political implications on all the different sections of the larger Brahmanical society, which is composed of conflicting classes. However, such a theoretical proposition needs to be validated while dealing with several such highly complex constructs. For example, there exist in the tradition a conceptual differentiation between the consorts and the sakti; the feminine power of the male gods. 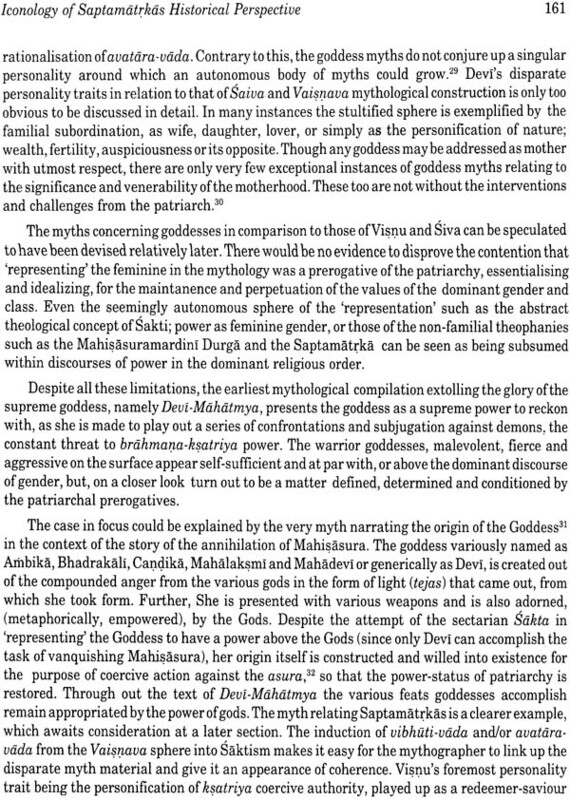 While the power position of a female consort is absolutely determined by the respective male gods, sakti suggests a relatively 'autonomous' power position. 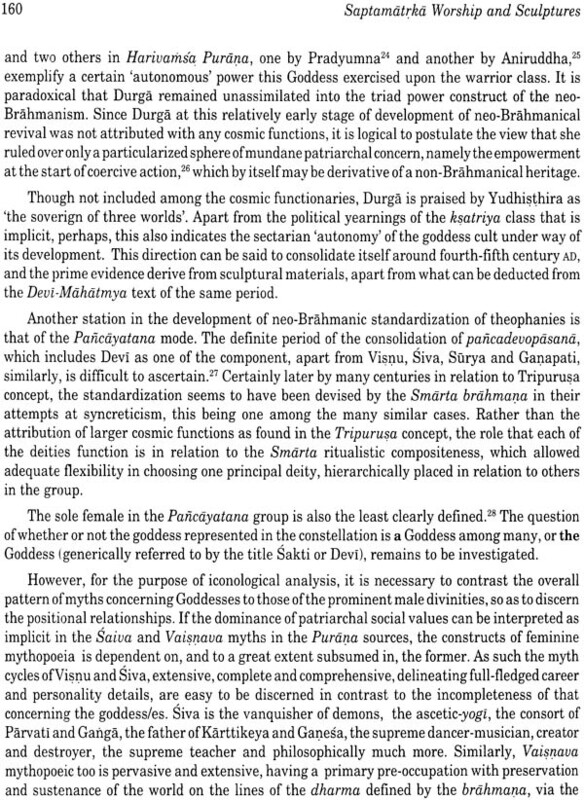 Yet, in different contexts of Brahmanical mythology consorts figure-in as sakti, making the anomalous power position of the goddesses a complex problematic. A very good example is the case of the subordinate power position of sakti in the. Ardhanarisvara myth and icons. Hence, the theoretical premise adopted for the interpretations pertains to the relative nature of the power of the female to that of the male, especially while considering myths as reflections of societal relations. The questions of relative gender power is viewed as located within the power conflicts and resolutions of classes. In other words, the relative gender positions criss-cross with the relative class positions and need to be viewed in this manner.